Like no other Stick player, Bob delves deep into the expressive guitar-like qualities of The Stick: bending, vibrato, ringing layered two-handed chords, and even strumming. His solo repertoire covers everything from classical to classic rock, traditional Celtic songs, and bluesy and new age originals. For over 30 years he's been a a defining voice on the instrument and a bold explorer of new Stick techniques. Through his instructional DVDs and many appearances at Stick Seminars, he's also become a highly sought teacher of the Free Hands method. Greg: You're not only one of the most highly regarded Stick players (many say you're the best), but also a gifted and experienced teacher of Free Hands, do you have a specific goal for your new�sticklessons.com�website? Bob: First of all, thank you for the kind words especially coming form yourself as one can say the same. I started the site to simply to express new ideas on technique, musical approaches and simplifying the learning curve for new and advanced players. I feel it is a good compliment to other teaching methods. Even though occasionally my approach is not always the same as others, to me there is no right or wrong. My ideas are for everyone to take out what ever they feel suits them.�All of the material is free. I don't plan on this becoming a fee based site. I do ask for small donations to help keep the site going with no obligation. The most exciting moments for me as a teacher is when someone just simply says "your lessons have been helpful" The goal is to have a nice collection of ideas to continue to help others further their development of musical performances with the Stick and other stringed instruments. Greg: Is there one aspect about the instrument that you've just recently "tapped into", something in your technique that's really got you excited? Bob: Now the main thing I am excited about and working on is articulation. There are many ways a single note can be sounded. �For each single hand, subtle pull off, plucking, slap, muting on the fret, vibratos, chord melody, and slight bending are examples. For two hands I continue to work on multi-layering parts and different hand configurations. Some examples include using the right hand thumb for extra melodies, reversing the hands, and my favorite idea over the past several years�is developing melody in the 5ths side. I found that you can perform whole songs similar to a classical guitarist with just the left hand. This frees up the right to add more variations of arrangement. When I play a song I will add in these above techniques to make the song sound more organic. The irony here is that many guitarists use tapping as another extension of their sound. I like to use techniques such as an occasional �pluck/pull or strum as an extension of my Stick sound. Greg:I know you're excited about your new release, Celtic Waters, your first new CD in quite a while. Would you care to tell us a little about it? Bob: The CD Celtic Waters is all traditional Celtic songs. As a diversion from writing, I have been studying traditional Celtic music and wanted to interpret more authentic melodies and ornamentation. It was not a surprise to find that capturing an authentic feel is quite difficult. In any style you really have to listen a lot to the genre. 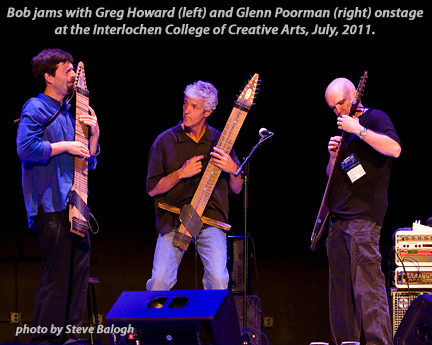 The pleasant surprise was discovering the differences between the geographical areas of Celtic music. I especially fell in love with Breton (French Celtic) music. This is the first CD in a long time that I an adding other instruments. The Stick is the main focus with an occasional second instrument such as a flute or cello. Over the past 10 years I have changed my approach to recording music and producing ideas.�I found myself bouncing around a bit with my interest in musical styles and writing. I am actually working on several projects at once, and I find myself recording what I'm feeling at the moment, rather than what the "current" project is. This is one of the main reasons I have not produced a new CD in a while. Some of these projects include an "coffee table book" about the Stick. One of my main interests is to bring the Stick to the general populace. Most people still have not heard of the instrument. And there are so many people that really don't understand what the Stick is or how it works. I perform for 1,000s of new ears every week. I always ask how many of you have ever seen the Stick before? Usually one, or zero hands go up. 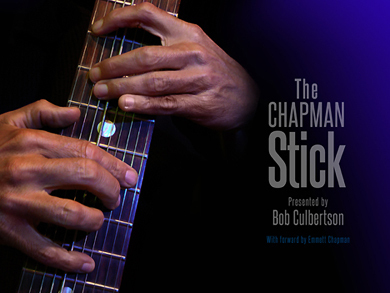 This is one of the main reasons for the book, the video What Is A Chapman Stick? and my musical interpretations of familiar music. Of course the other aspect of creating music is original material. I always say the Stick is such a perfect canvas for this. There are still so many unexplored places to go with the instrument. Writing new music is also a big part of my musical career. Perhaps these are some of the reasons I have been jumping around in my work. With all this said the biggest influence and pleasure in my life was getting married six years ago and now having two sons. I feel very fortunate to have such a wonderful family and yet be part of an amazing global musical community with The Stick. 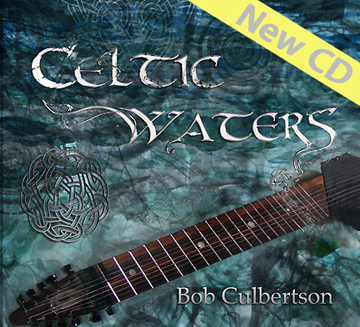 Bob's new CD, Celtic Waters, is available as a download from Bandcamp, and soon on disc from Stick Enterprises. Solos on Grand Stick, Alto Stick and the AcouStick prototype, and duets with flutes and cello. 17 tracks.